METHODS: Concentrations of cefazolin and metronidazole in TISF and serum following TAAD and in serum following IVAD were compared in 5 female volunteers. Subjects received cefazolin or cefazolin plus metronidazole by IVAD alone and by TAAD alone. One subject also received concomitant IVAD and TAAD of these 2 antibiotics. Sequential samples of serum or subcutaneous TISF were assayed for antibiotic concentration. 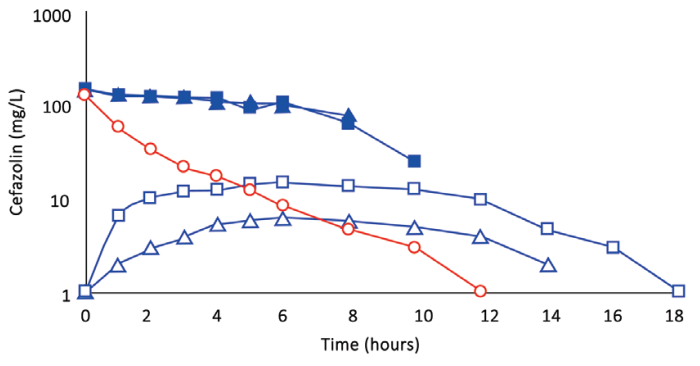 RESULTS: Cefazolin (1g) by TAAD resulted in an area under the curve of the concentration–time profle and a maximum concentration (Cmax) in subcutaneous tissue that were 16.5 and 5.6 times greater than in serum following 1g by IVAD. Metronidazole (500mg) by TAAD resulted in an area under the curve and Cmax that were 8.1 and 24.7 times greater in TISF, than in serum after 500mg by intravenous delivery. IVAD + TAAD resulted in superior antibiotic concentrations to IVAD alone. Surgical site infection (SSI) and bacterial drug resistance remain major problems.1–3 Intravenous antibiotic delivery (IVAD) may not reliably achieve adequate subcutaneous antibiotic concentrations.4-ics, dissolved in saline, before incision reduce the risk of SSI.9–14 TAAD is a novel mode of drug delivery that delays systemic drug absorption and prolongs local subcutaneous drug effects. This research was an exploratory phase 1 pharmacokinetic clinical trial comparing the subcutaneous and systemic bioavailability of antibiotics following TAAD or IVAD. After TAAD, subcutaneous interstitial ﬂuid is designated tumescent interstitial ﬂuid (TISF). The principal aim of this research was to measure concentrations of cefazolin and metronidazole over time in subcutaneous tissue and serum following TAAD and in serum following intravenous (IV) delivery. We hypothesize that, at equal doses, TAAD provides uniformly greater subcutaneous antibiotic concentrations, area under the curve (AUC∞), maximum concentrations (Cmax), and T > minimum inhibitory concentration (MIC; duration of time that drug concentration exceeds MIC) compared with IV delivery. A secondary research aim was to determine the correlation between the antibiotic concentration (mg/L) in a TAAD solution and the resulting antibiotic concentration (mg/L) in TISF immediately after tumescent delivery. We hypothesized that these 2 concentrations are highly correlated and nearly equal. Another secondary research aim was to observe the concentration–time profles of cefazolin and metronidazole in serum and TISF after subcutaneous tumescent infltration. We hypothesize that, at equal antibiotic doses and equal concentration in TAAD solution, concentration–time profles of cefazolin and metronidazole in TISF are virtually identical. Further, we hypothesize that systemic antibiotic absorption following TAAD has a concentration–time profle in serum that resembles a slow constant IV infusion. Adding cefazolin to a TAAD solutions involved withdrawing 10mL from the TLA solution and injecting it into a vial of cefazolin powder then injecting the solubilized cefazolin into the bag of TLA solution. Adding metronidazole to a TAAD solution involved transferring 500mg in 100mL into 1,110mL of a TLA solution. Subjects 1, 2, and 3 received cefazolin once by IV infusion and then twice by tumescent infltration. Subject 4 received cefazolin and metronidazole dissolved in a single IV bag on 1 occasion by IVAD and by TAAD into abdomen on another occasion. Subject 5 received concurrent cefazolin and metronidazole, once by IVAD, once by TAAD, and once by concomitant IVAD + TAAD. Procedures for individuals were at least 7 days apart to assure complete antibiotic clearance before a subsequent study. Video Graphic 1. 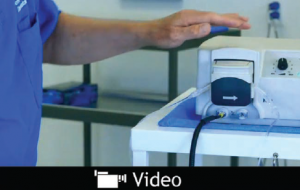 See video, Supplemental Digital Content 10, which demonstrates the preferred technique for subcutaneous infiltration of TAAD solution using a multiholed plastic subcutaneous catheter, HK SubQKath. This video is available in the related Videos section of the Full-Text article on PrSGlobalOpen.com or available at http://links.lww.com/PRSGO/A443. Subcutaneous tumescent infltration was accomplished using a peristaltic pump, infltration tubing, and Monty infltration cannulas (HKSurgical.Com, San Clemente, Calif.). All patients were fully awake and received no parenteral sedation (see videos, Supplemental Digital Content 10, which demonstrates the preferred technique for subcutaneous infltration of TAAD solution using a multiholed plastic subcutaneous catheter, HK SubQKath, http://links.lww.com/PRSGO/A443 and Supplemental Digital Content 11, which demonstrates the technique for painless subcutaneous infltration of large volumes of TLA using multiholed stainless steel cannulas, http://links.lww.com/PRSGO/A444). IV antibiotic infusion was accomplished over 5 minutes via an antecubital vein. Serum samples were obtained via an indwelling IV catheter in a contralateral antecubital vein. After IVAD, only serum antibiotics concentrations were measured. After TAAD, serum and TISF concentrations were measured. Blood sampling technique frst removed 2mL of blood, which was discarded; then 10mL of blood was obtained in a second syringe for drug assay. Finally, the IV catheter was ﬂushed with 2mL saline and then heparin (5 units/0.5mL). Beginning at time t = 0 immediately after antibiotic delivery, sequential blood samples were obtained at hours 0, 1, 2, 3, and 4 hours and then every 2 hours. Serum samples were frozen. Video Graphic 2. See video, Supplemental Digital Content 11, which demonstrates the technique for painless subcutaneous infiltration of large volumes of TlA using multiholed stainless steel cannulas. This video is available in the related Videos section of the Full-Text article on PrSGlobalOpen.com or available at http://links.lww.com/PRSGO/A444. 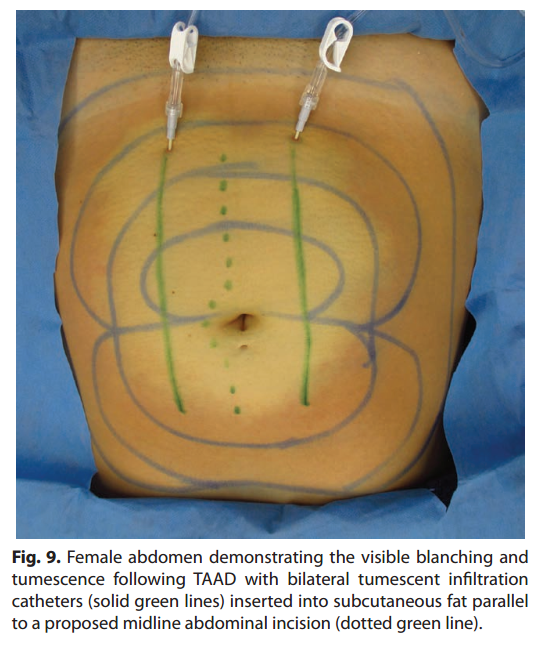 Sequential samples of tumescent adipose tissue (10–20mL) were obtained by hand-held syringe liposuction at time T0 immediately after TAAD and continued at hours 1, 2, 3, and 4 and then every 2 hours until the subject experienced liposuction-associated pain. Samples of fat aspirate were centrifuged, supernatant fat was discarded, and infranatant TISF was frozen. Both serum and interstitial ﬂuid samples were assayed for antibiotic concentration by high pressure liquid chromatography. The correlation (R2) between the antibiotic concentration (mg/L) in TAAD solution and Cmax (mg/L) in liposuctioned aspirate (TISF) was determined. The bioavailability of a drug in a tissue was measured by calculating AUC, the area under the concentration time curve C(t) over the interval (0,T0), where t = 0 is the time immediately after drug delivery and time t = T0 is the time when the drug concentration in the targeted tissue has returned to zero. C(T), base length (T0-T) and area 1/2 C(T)(T0-T). The research cohort consisted of 5 healthy adult female volunteers, ages 37–64 years. Each subject participated in 2–3 pharmacokinetic procedures. There were 15 pharmacokinetic procedures: 6 IVAD procedures and 9 TAAD procedures. The maximum concentrations of cefazolin and metronidazole in a TAAD solution were 900mg/L and 413mg/L, respectively. See Figures 1–5 and Tables 1–5 for individual concentration–time profles. Lidocaine dosages ranged from 20 to 45mg/kg (see additional fgures and supplemental raw data, Supplemental Digital Content 1–9, http://links.lww.com/PRSGO/A442). In TISF, peak antibiotic concentrations (Cmax) occurred at the time of the initial sample, thereafter concentrations declined linearly. 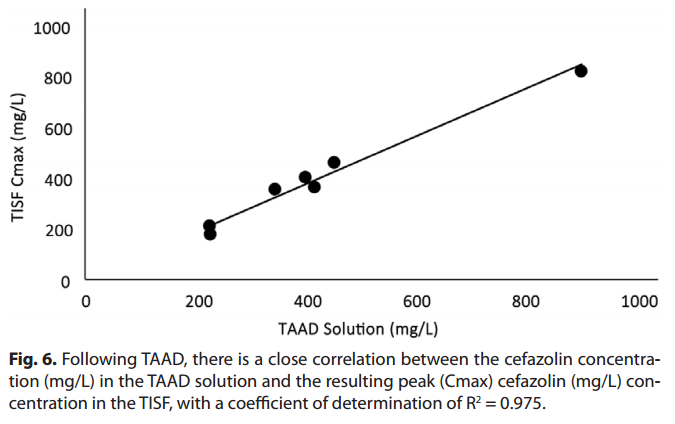 TAAD produced a Cmax for both cefazolin and metronidazole in TISF approximately equal to the mg/L concentration in TAAD solution (R2 = 0.97; Fig. 6). In serum after TAAD, antibiotic Cmax occurred after 8–12 hours, thereafter concentrations declined slowly over many hours. In serum after IVAD, Cmax occurred at the time of the initial serum sample, thereafter concentrations declined exponentially. When antibiotic doses by TAAD and IVAD were equal, the antibiotic concentrations in TISF after TAAD were strictly greater than in serum after IVAD at every time point. It follows that AUC∞, Cmax, and T > MIC (for any hypothetical MIC) in TISF after TAAD were greater than in serum after IVAD. Fig. 1. (Subject 1): Comparison of concentration–time profles of cefazolin by IVAD (red) and TAAD (blue) into subcutaneous abdominal fat of a 74.3-kg female. Square symbols represent 1,000 mg by TAAD1 in a 900 mg/l solution. Triangle symbols represent 1,000 mg by TAAD2 in a 450 mg/l solution. round red symbols show 1,000 mg by IVAD. Closed symbols represent concentrations in TISF, and open symbols are concentrations in serum. Fig. 2. (Subject 2): Comparison of concentration–time profles of cefazolin by IVAD (red) and TAAD (blue) in the breasts of a 76.4-kg female. Square symbols represent 500 mg by TAAD1 in a 450 mg/l solution (one breast). Triangle symbols represent 500 mg by TAAD2 in a 225 mg/l solution (bilateral breasts). round red symbols show 1,000 mg by IVAD. Closed symbols represent concentrations in TISF, and open symbols are concentrations in serum. Fig. 3 (Subject 3): Comparison of concentration–time profles of cefazolin by IVAD(red) and TAAD (blue) into the hips and outer thighs of a 66.4-kg female. Square symbols represent 870 mg by TAAD1 in a 228 mg/l solution (bilateral). Triangle symbols represent 435 mg by TAAD2 in a 228 mg/l solution (one side). round symbols show 1,000 mg by IVAD. Closed symbols represent concentrations in TISF, and open symbols are concentrations in serum. Subject 1 received 1g of cefazolin by TAAD and 1g of cefazolin by IVAD. The AUC∞ and Cmax in interstitial ﬂuid were 16.5 and 5.6 times greater, respectively, after TAAD than in serum after IVAD. Subject 4 received 500mg of metronidazole by TAAD and 500mg metronidazole by IVAD. The AUC∞ and Cmax for metronidazole were 8.1 and 24.7 times greater, respectively, in TISF after TAAD than in serum after IVAD. 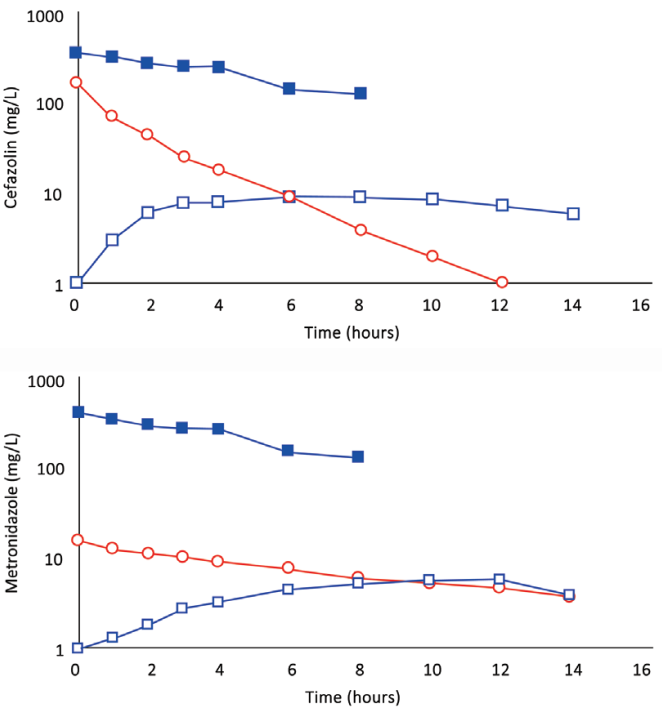 After TAAD, the AUC∞ for cefazolin in TISF increased when the mg/L concentration of cefazolin was increased in the TAAD solution (subject 2) and when mg dose of cefazolin was increased in the TAAD solution (subject 3). As expected, because of differences in volume of distribution and rates of clearance, equal mg doses of cefazolin and metronidazole by IVAD produced considerably different concentration–time profles in serum. 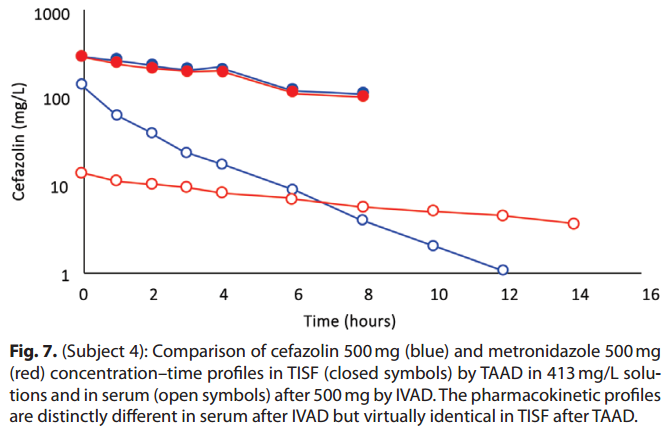 In contrast, TAAD of equal mg doses and equal mg/L concentrations of cefazolin and metronidazole in the TAAD solution resulted in identical concentration–time profles in TISF (subject 4; Fig. 7). For subject 5, when the total doses of cefazolin and metronidazole by IVAD + TAAD equaled the doses by IVAD, IVAD + TAAD resulted in more prolonged serum antibiotic concentration and higher TISF concentrations compared with IVAD alone. The maximal rates of subcutaneous tumescent infltration ranged from 125mL/min to 250mL/min. At this rate the infltration was virtually painless. No adverse or unusual systemic or cutaneous reactions (inﬂammation, tenderness, unusual ecchymosis) were observed following TAAD. Fig. 4. 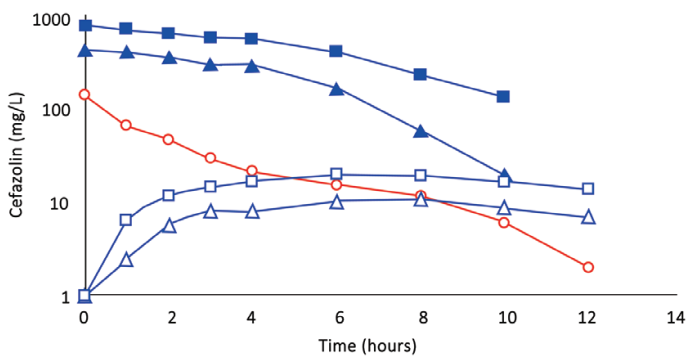 A, (Subject 4): Comparison of cefazolin concentration–time profles after 500 mg by IVAD (red, round symbols) and 500 mg by TAAD (blue, square symbols) in 413 mg/l solutions into subcutaneous abdominal fat of a 66.3-kg female. Closed symbols represent concentrations in TISF, and open symbols are concentrations in serum. 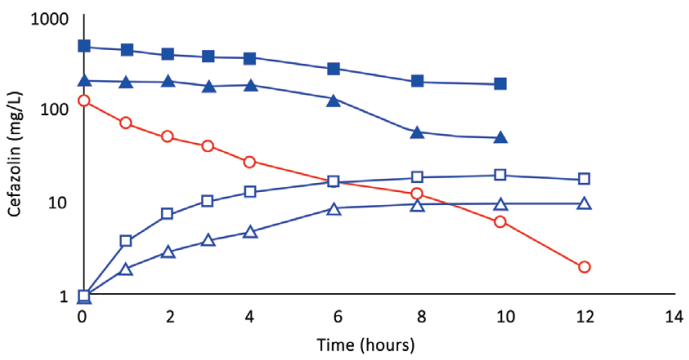 B (Subject 4): Comparison of metronidazole concentration–time profles after 500 mg by IVAD (red, round symbols) and 500 mg by TAAD (blue, square symbols) in 413 mg/l solutions into subcutaneous abdominal fat of a 66.3-kg female. Closed symbols represent concentrations in TISF, and open symbols are concentrations in serum. This research was an exploratory phase 1 clinical trial comparing 2 modes of antibiotic delivery: IVAD and TAAD, a novel mode of antibiotic delivery. We compared IVAD and TAAD with respect to bioavailability and maximum tissue antibiotic concentrations (Cmax). TAAD consists of antibiotics dissolved in a solution of TLA. TLA solutions consist of lidocaine (< 1g/L), epinephrine (< 1mg/L), sodium bicarbonate (10 mEq/L) dissolved in 0.9% physiologic saline. where SSIs are more common than in cosmetic surgery. Fig. 5. 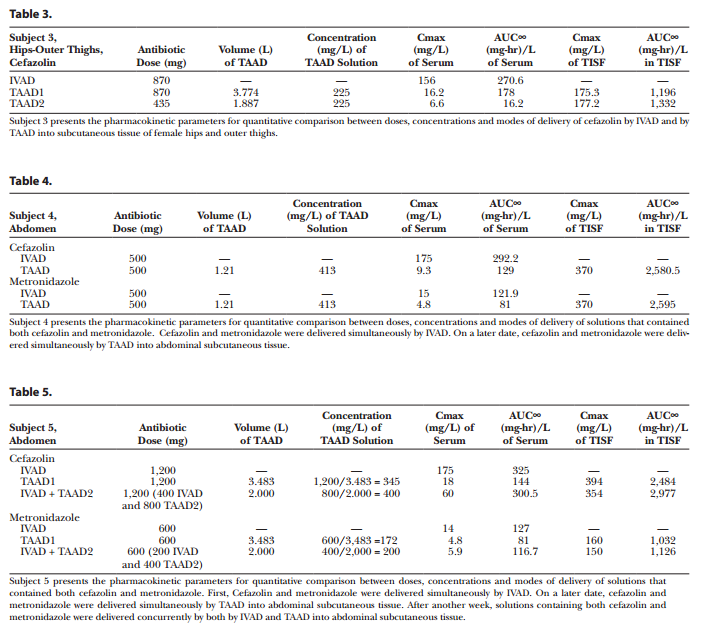 A, (Subject 5): Comparison of concentration–time profles following 1,200 mg of cefazolin by IVAD1, by TAAD1, and by concomitant IVAD2 + TAAD2. Square blue symbols represent TAAD1 of a 1,200 mg/l solution. Triangle green symbols represent 800 mg by TAAD2 in a 800 mg/l solution with concomitant 400 mg by IVAD2. round red symbols show 1,200 mg by IVAD1. Closed symbols represent concentrations in TISF, and open symbols are concentrations in serum. B, (Subject 5): Comparison of concentration–time profles following 600 mg of metronidazole by IVAD1, TAAD1, and IVAD2 + TAAD2. Square blue symbols represent TAAD1 of a 600 mg/l solution. Triangle green symbols represent 400 mg by TAAD2 in a 400 mg/l solution with simultaneous 200 mg by IVAD2. round red symbols show 600 mg by IVAD1. Closed symbols represent concentrations in TISF, and open symbols are concentrations in serum. TAAD-like subcutaneous antibiotic concentrations solely by IVAD might not be possible or might pose a signifcant risk of harm to patients. At equal antibiotic doses, TAAD provides superior subcutaneous antibiotic bioavailability (AUC∞), Cmax, and T > MIC compared with IVAD. Assuming equal IV doses, the concomitant delivery by TAAD + IVAD is pharmacokinetically superior to IVAD alone. Tumescent drug delivery has 3 distinct therapeutic properties: local physical effects, local pharmacologic effects, and systemic pharmacologic effects. Local physical effects of TAAD include mechanical compression of capillaries and veins. The 0.9% saline component of a tumescent solution provides prolonged local tissue hydration that prevents desiccation of the surgical wound surface. Tumescent tissue acts as a subcutaneous reservoir of 0.9% saline solution at the infltration (incision) site and can reduce IV ﬂuid requirements. Local pharmacologic effects of TAAD include epinephrine-induced prolonged and profound capillary vasoconstriction. TAAD takes advantage of the fact that subcutaneous drug absorption is perfusion-rate limited. Reduced subcutaneous blood ﬂow with TAAD effectively isolates the TISF from the systemic circulation resulting in sustained local drug action. The concentration of a TAAD solution of antibiotics that is nontoxic to subcutaneous tissues may far exceed the antibiotic concentration that can be reliably achieved in subcutaneous tissue by IVAD. patients.44 Continuous IV infusion may reduce the emergence of bacterial resistance and overcome existing resistant bacteria.45,46 Slow systemic absorption of lidocaine and antibiotics following TAAD produces serum concentration–time profles that resemble a slow constant IV infusion persisting for 12 hours or more. concentration to which gut microﬂora are exposed. Following IVAD, concentrations of cefazolin and metronidazole are typically lower in interstitial ﬂuid than in serum.48–50 Our results show that concentrations in serum after IVAD were always less than in TISF after TAAD, at every time point. Thus, TAAD + IVAD is always superior to IVAD alone with respect to AUC∞, Cmax, and T>MIC in subcutaneous interstitial ﬂuid and in serum, assuming equal IVAD doses. This suggests that TAAD + IVAD ought to improve antibiotic prophylaxis of wound infections. cautery, capillary thrombosis, and tissue desiccation. After IVAD, a concentration gradient can develop between an incision site surface (lower concentration) and the vascular compartment (higher concentration). TAAD alone is pharmacokinetically superior to IVAD for achieving high, prolonged subcutaneous antibiotic concentrations in wounds confned to skin and subcutaneous tissue. This suggests the hypothesis that TAAD alone may reduce the risk of incision site wound infection and bioflm formation of subcutaneous implanted devices. TAAD + IVAD is pharmacokinetically superior to TAAD alone or IVAD alone, assuming equal IVAD doses, for achieving high, prolonged subcutaneous and systemic antibiotic concentrations. This suggests a second hypothesis that TAAD + IVAD is superior to IVAD alone for preventing SSI in wounds involving deep organs and tissues. Cefazolin and metronidazole have distinctly different pharmacokinetic characteristics after IVAD. But after TAAD, the subcutaneous concentration–time profles of cefazolin and metronidazole are virtually identical. This suggests that diverse drugs, including antibiotic, antiviral, antifungal, and antitumor drugs, may have similar subcutaneous concentration–time profles in TISF after tumescent delivery. We found no adverse effects of tumescent cefazolin, metronidazole, lidocaine, or epinephrine. The subcutaneous injection of cefazolin and metronidazole is “off-label” according to United States Food and Drug Administration–approved package insert labeling. Yet, subcutaneous antibiotic delivery for systemic effect is commonly used for palliative therapy.56–65 These reports and our present data suggest that tumescent delivery of dilute cefazolin and metronidazole represents a nonsignifcant risk of harm to patients. In clinical practice, we suggest using 1L or more of TAAD solution consisting of 1g cefazolin, 500mg of metronidazole, 1g of lidocaine with 1mg epinephrine, and 10 mEq sodium bicarbonate per 1L bag of 0.9% physiologic saline or Ringer’s lactate. 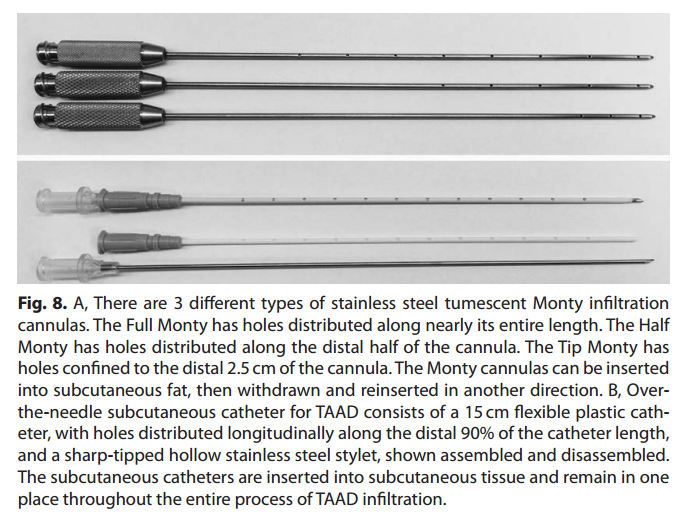 Stainless steel tumescent infltration cannulas or plastic tumescent subcutaneous catheters are used for effcient, painless TAAD (Fig. 8, 9). A trained nurse can perform TAAD infiltration in the patient’s hospital room or in the preoperative area 1–3 hours before incision, thus reducing the surgeon’s work load in the operating room and allowing time for detumescence and optimal interstitial distribution of the TAAD solution. The prolonged high tumescent antibiotics concentrations in subcutaneous tissue may reduce the need to precisely give IV antibiotics 30–60 minutes before an incision. The 0.09% lidocaine in the TAAD solution reduces the pain associated with antibiotic injection, provides immediate onset of local surgical anesthesia and prolonged postoperative analgesia. The lidocaine component of a TAAD solution has signifcant antibacterial, antiplatelet, and systemic antiinﬂammatory effects. Lidocaine has signifcant pharmacologic antiinﬂammatory properties at clinically safe serum concentrations. Lidocaine may inhibit systemic inﬂammatory responses to surgical trauma and bacterial infection.81–96 Tumescent infltration into traumatized or infected tissue engulfs large volumes of damaged tissue, which may prevent or delay the systemic absorption of inﬂammatory cytokines, chemokines, histones, and pathogens. total mg/kg dosage permitted for any individual patient. Every bag of TAAD solution must be clearly labeled on both sides with tumescent safety labels that state, “Subcutaneous Tumescent Lidocaine, Not for IV.” Inadvertent IV delivery of a TAAD solution must be avoided. This research has involved a limited number of patients and is not designed to replicate procedures, test hypotheses, or estimate pharmacokinetic parameters. Our data suggest that TAAD + IVAD is pharmacokinetically superior to IVAD for SSI prevention, but it does not show that TAAD + IVAD is clinically superior to IVAD for SSI prevention. Some measurements of antibiotic tissue concentrations were discontinued before complete clearance of the antibiotic. In such cases, the last measured antibiotic concentration was > 0, and the estimation of AUC∞ required a subjective visual estimation of the terminal concentration–time curve. Nevertheless, the differences between clinically measured portions of the AUC∞ were so pronounced that the size of the last portion of the AUC∞ did not affect the conclusions. requires clinical investigation to document its safety. Subcutaneous antibiotic bioavailability using TAAD is superior to that of IVAD. The hypothesis that combined TAAD + IVAD is more effective than IVAD alone for SSI prevention, assuming equal IV antibiotic doses, remains to be tested with RCT. There was no evidence that TAAD of cefazolin and metronidazole poses a signifcant risk of harm to patients. Atoussa Cameron, RN, NP, and JoAnn Coker, RN, NP, assisted in caring for patients and obtaining the serum samples. Jonathan Good, Toxicology/Drug Monitoring Lab, Mayo Clinic, Rochester, Minn., performed the cefazolin high-performance liquid chromatography assays. Paytra Klein proof read drafts of the article and checked the accuracy of reference citations. Susan Ruffalo edited an early version of the article. *Dr. Klein owns patents on devices for tumescent drug delivery by subcutaneous infltration. Dr. Klein’s wife, Kathleen Hutton-Klein, MD, owns HK Surgical, Inc., a company that sells devices for tumescent drug delivery. †Dr. Langman has no conﬂicts of interest to report. This was investigator-initiated research, funded entirely by the authors. The Article Processing Charge was paid for by the authors. 1. Boehm O, Baumgarten G, Hoeft A. Epidemiology of the highrisk population: perioperative risk and mortality after surgery. Curr Opin Crit Care. 2015;21:322–327. systematic review. Int J Surg. 2012;10:242–249. Nosocomial Infection Control Consortium. Surg Infect (Larchmt). surgical site infection. Anesth Analg. 2011;113:730–737. detected in breast implant-associated anaplastic large-cell lymphoma. Plast Reconstr Surg. 2016;137:1659–1669. device-associated infection. Plast Reconstr Surg. 2013;132:1319–1328. staphylococcal bloodstream and prosthetic-device-associated infections: the role of bioflm formation and distribution of adhesin and toxin genes. J Med Microbiol. 2014;63:1500–1508. 8. Franchelli S, Pesce M, Savaia S, et al. Clinical and microbiological characterization of late breast implant infections after reconstructive breast cancer surgery. Surg Infect (Larchmt). 9. Bhargava P, Mehrotra N, Kumar A. Wound infection after metronidazole infltration. Trop Doct. 2006;36:37–38. appendectomy by using metronidazole preoperatively to infltrate tissues at the incision. Am J Surg. 1997;174:422–424. study of 200 patients]. Langenbecks Arch Chir. 1996;381:318–322. prospective controlled trial. J R Coll Surg Edinb. 1989;34:13–16. the gastrointestinal tract. Surg Gynecol Obstet. 1984;158:303–307. Augmentin in abdominal operations. Ann R Coll Surg Engl. 18. Shimizu Y, Nagasao T, Taneda H, et al. Combined usage of intercostal nerve block and tumescent anaesthesia: an effective anaesthesia technique for breast augmentation. J Plast Surg Hand Surg. local anesthesia. Ann Plast Surg. 2016;76:13–17. 20. Sleth JC, Servais R, Saizy C. [Tumescent infltrative anaesthesia for mastectomy: about six cases]. Ann Fr Anesth Reanim. burn surgery. Ann Burns Fire Disasters. 2011;24:144–148. injection on split-thickness skin graft donor site perfusion, healing, and pain. J Burn Care Res. 2013;34:e80–e86. 24. Cohn MS, Seiger E, Goldman S. Ambulatory phlebectomy using the tumescent technique for local anesthesia. Dermatol Surg. of mechanisms of action. Ann Vasc Surg. 2012;26:424–433. pain associated with balloon angioplasty of hemodialysis fstulas. 27. Behroozan DS, Goldberg LH. Dermal tumescent local anesthesia in cutaneous surgery. J Am Acad Dermatol. 2005;53:828–830. children. J Eur Acad Dermatol Venereol. 2013;27:e171–e175. 29. Ramon Y, Barak Y, Ullmann Y, et al. Pharmacokinetics of highdose diluted lidocaine in local anesthesia for facelift procedures. procedure. Aesthetic Plast Surg. 1998;22:404–407. original technique and results. Am J Surg. 2009;198:e27–e31. 34. Prasetyono TO, Koswara AF. Linear hand burn contracture release under local anesthesia without tourniquet. Hand Surg. surgery on operative feld visibility in hand surgery without tourniquet. J Hand Surg Am. 2015;40:1606–1609. satisfaction. Arch Plast Surg. 2014;41:312–316. plus metronidazole for antibiotic prophylaxis at cesarean section. South Med J. 2003;96:992–995. controlled double blind trial. Aust N Z J Surg. 1980;50:429–433. Diseases Society of America; Surgical Infection Society. water-soluble prodrug for parenteral solutions of metronidazole. Advisory Committee. Am J Infect Control. 1999;27:97–132; quiz 133. 44. Bergamini TM, Peyton JC, Cheadle WG. Prophylactic antibiotics prevent bacterial bioflm graft infection. J Surg Res. 1992;52:101–105. intermittent beta-lactam infusion in critically ill patients with severe sepsis. Intensive Care Med. 2016;42:1535–1545. in critically ill patients. Intensive Care Med. 2014;40:1340–1351. Respir Crit Care Med. 2015;36:136–153. Acad Sci U S A. 2012;109:10775–10780. resistance allows swimming bacteria to colonize an antibiotic gradient. ISME J. 2016;10:30–38. 55. Nielsen EI, Friberg LE. Pharmacokinetic-pharmacodynamic modeling of antibacterial drugs. Pharmacol Rev. 2013;65:1053–1090. of antibiotics subcutaneously: an integrative literature review. 57. Robelet A, Caruba T, Corvol A, et al. [Antibiotics given subcutaneously to elderly]. Presse Med. 2009;38:366–376. patients. Antimicrob Agents Chemother. 2010;54:924–926. 59. Walker P, Neuhauser MN, Tam VH, et al. Subcutaneous administration of cefepime. J Pain Symptom Manage. 2005;30:170–174. 60. Melin-Coviaux F, Hary L, Hurtel AS, et al. Etude pharmaco-clinique comparative de la ceftriaxone par voie sous-cutanee et intraveineuse chez la personne agee. Revue Geriatr. 2000;25:337–347. tolerance of ceftriaxone after subcutaneous administration]. 62. Borner K, Lode H, Hampel B, et al. 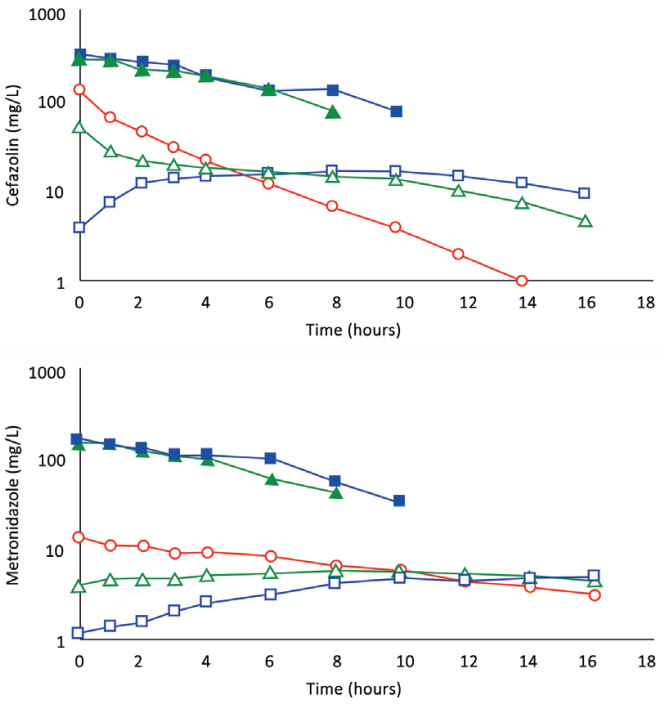 Comparative pharmacokinetics of ceftriaxone after subcutaneous and intravenous administration. Chemotherapy. 1985;31:237–245. years of age. Med Mal Infect. 2014;44:275–280. surgical site infection after gastric surgery: a multicenter prospective cohort study. Infect Chemother. 2013;45:422–430. surgical wound infection. Plast Reconstr Surg. 2002;110:1275–1279. lidocaine infusion in a Staphylococcus aureus-induced wound infection in a mouse model. Ann Plast Surg. 2014;73:598–601. roles of the lipocalin-2 pathway. Anesth Analg. 2015;121:81–89. bacterial sodium channel. J Gen Physiol. 2012;139:507–516. germ tube formation by Candida albicans by local anesthetics: an effect related to ionic channel blockade. Curr Microbiol. 75. Johnson SM, Saint John BE, Dine AP. Local anesthetics as antimicrobial agents: a review. Surg Infect (Larchmt). 2008;9:205–213. 76. Nachmias V, Sullender J, Asch A. Shape and cytoplasmic flaments in control and lidocaine-treated human platelets. Blood. ADP-induced P-selectin expression and platelet-leukocyte aggregation. Acta Anaesthesiol Taiwan. 2009;47:56–61. coagulation: implications for epidural blood patch. Anesth Analg. local anesthetics on platelet aggregation in vitro. J Liposome Res. and microcirculation. Anesth Analg. 2002;94:1441–1447. inﬂammatory response and organ protection. Curr Pharm Des. and transendothelial migration in septic patients. J Immunol. radical hysterectomy. Int J Clin Exp Med. 2014;7:3398–3403. the anti-inﬂammatory cytokine IL-10 following mechanical ventilation in healthy mice. Acta Anaesthesiol Scand. 2015;59:47–55. and trypsin. Crit Care Med. 2000;28:484–489. 91. Nishina K, Mikawa K, Takao Y, et al. Intravenous lidocaine attenuates acute lung injury induced by hydrochloric acid aspiration in rabbits. Anesthesiology. 1998;88:1300–1309. reducing injury in a rat electrical burn model. Ann Plast Surg. Toll‑like receptor 4. Mol Med Rep. 2014;9:118–124. murine septic peritonitis. Anesthesiology. 2004;101:902–911. macromolecular leakage in vivo. Anesthesiology. 1997;87:617–624. 97. De Oliveira GS, Jr, Fitzgerald P, Streicher LF, et al. Systemic lidocaine to improve postoperative quality of recovery after ambulatory laparoscopic surgery. Anesth Analg. 2012;115:262–267. bud in calves. Vet Anaesth Analg. 2012;39:431–435. quo vadimus? Anesth Analg. 2011;113:1242–1253. with lidocaine reduces pain and opioid consumption after reduction mammoplasty. Reg Anesth Pain Med. 1998;23:575–579. reduces morphine requirements and postoperative pain of patients undergoing thoracic surgery after propofol-remifentanilbased anaesthesia. Eur J Anaesthesiol. 2010;27:41–46. pain on skin infltration with lidocaine, with or without epinephrine. Anesth Analg. 1987;66:572–574. 104. Grazer FM, de Jong RH. Fatal outcomes from liposuction: census survey of cosmetic surgeons. Plast Reconstr Surg. 106. Habbema L. Safety of liposuction using exclusively tumescent local anesthesia in 3,240 consecutive cases. Dermatol Surg.